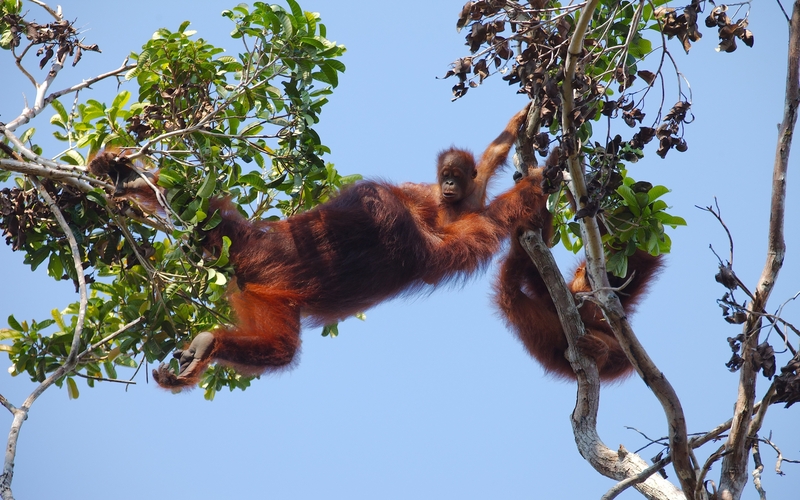 I had the opportunity to visit Tanjung Puting National Park with some friends in mid-June of 2012. Tanjung Puting is a national park with an area of more than 3000 km² located in the southern province of Central Kalimantan. The main attraction of this national park is the population of Orangutans. The National Park serves as a center for research and conservation of orangutans and its habitat protection. We reach Tanjung Puting by departing from Soekarno Hatta International Airport in Jakarta, arriving in Pangkalan Bun’s Iskandar Airport less than one hour later by way of Trigana Air’s Boeing 737-200. Kalstar airlines also services this route and there are daily flights. Upon arrival at the airport, Aidi’s team picked us up and drove us the half hour needed to a pier in Kumai where we were greeted with a traditional dance performance. The most popular way to reach Tanjung Putting is by “klotok”, a traditional motorized boat used to navigate the rivers of Kalimantan. Our klotok measured about 12 x 3 meters and consisted of two decks. The bottom deck was used by the captain and his crew, the cook and the guides. The main deck above was prepared for the passengers to use as both sleeping quarters or a place to relax and eat. The top deck is open to the sides so privacy for the tourists is at a premium. Each klotok is equipped with one or two toilets and showers. The clean water comes from a water tank, and shower water is pumped directly from the river. There is a large refrigerator on board to carry enough food for several days. The cook does an incredible job of preparing tasty dishes, typically with a traditional Indonesian flavor, and always presented with a variety of drinks and fruits. The klotok provides electrical outlets for recharging devices, but it runs on a generator which only functions when the boat’s engine is switched off. On our trip, the system was damaged on the third day. Other klotoks use inverters connected to a car battery which can only be recharged when the klotok is moving. Klotoks used to serve an important function hauling logs out of the river to the port of Kumai. Klotok had no upper deck and only a small cabin for the ship’s captain on that time. Once logging became more controlled and limited, the klotoks were retrofitted to serve the ecotourism industry and that is how they are used today. Speed boats provide an alternate mode of transport, moving 50 km/hr or more up river while klotoks plod along at 10 km/hr or less. For the purposes of ecotourism, though, klotoks are unmatched. They are much more comfortable, have bathrooms and are configured to accommodate sleeping and eating on board. Even at their slow cruising speeds, klotoks can still be too fast to see all the amazing scenery along the sides of the river. We headed to the Sekonyer River After leaving the pier in Kumai, the gateway to Tanjung Puting National Park. The trip from the pier to the Sekonyer river normally takes about 30 minutes. At the entrance to the river, we were put through the traditional custom of washing faces with a water stream. The Sekonyer River acts as a dividing line between the national park forest on the right (South) and the forest buffer zone on the left (north). Only a few kilometers to the north there are immense palm oil plantations stretching for many kilometers and posing a huge threat to the survival of the remaining rainforest on Borneo island. Our first stop was Tanjung Harapan (Cape of Good Hope), Away about 15 kilometers from the mouth of the river. This camp is home to a plot of land planted with medicinal plants endemic to the island. There is also an information center covering the endemic plants and the Orangutans. 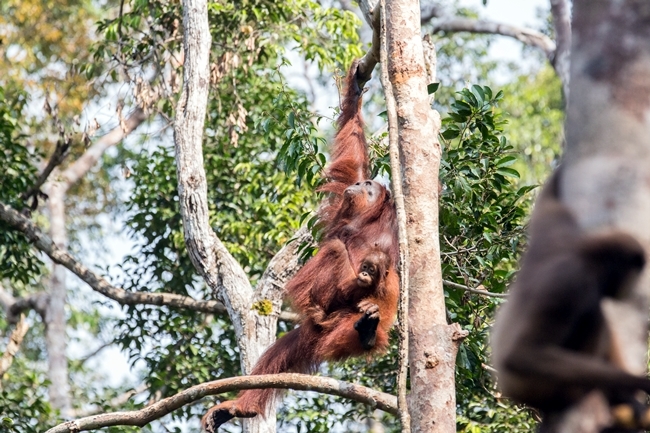 We first encounter the orangutans at a feeding platform about 750 meters into the forest from the information center. Food is placed on the stage in order to avoid competition with other animals, and the orangutans come to eat. Squirrels and wild boar are also in the area, stealing food sometimes. Tanjung Harapan together with Pondok Tanggui and Camp Leakey are the three places in the park where rehabilitated orangutans are released into the wild. There are currently no new animals being released because this area is full of wild orangutans and it is feared that release of additional orangutans will bring disease or create unfair competition with the wild ones. Those passing the rehabilitation process are now released into Lamandau Nature Reserve, on the west of Pangkalan Bun. Orangutans are seen at the feeding platforms almost every day except for days when the food in the forest is so abundant they don’t need supplemental feeding. The feeding platforms are not meant to replace the normal meals. We were lucky and we got to observe many orangutans that was coming to the feeding platforms, including the local king Yani. The dominant alpha males are very fierce looking with a thick layer at the temples, fuller beard and an even more reddish color than the others. We went to the village of Sei Sekonyr located not more than 100 meters from the pier after visiting Tanjung Harapan. 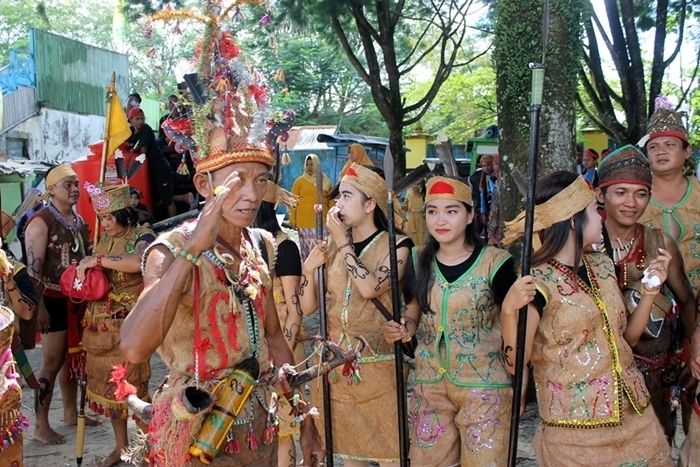 The village is right in the center of the National Park, and it is being directed by the government to support ecotourism. Many of the villagers displayed signs protesting against BW Plantation – a palm oil company. The quality of life in the village has been going down due to the environmental impact of the palm oil plantations. The village contains a few interesting spots for tourists as well as a gift shop. The villagers farm, fish, or work for the national park, palm oil plantations or mining companies. We left Sekonyer River past 5pm. The late afternoon before sunset is a good time to observe the proboscis monkeys which live in treetop groups along the riverbanks. During the day they forage in the forest leaving their treetop roosts. These monkeys have long noses and the bigger the nose on a male, the more the females seem to enjoy them. After our hunt for proboscis monkeys ended, we headed to the Rimba Ecolodge one kilometer from Sekonyer. The lodge is only accessible from the river and it is the only place with professional services along the whole river. The rooms are on stilts over the marshland and the lodge is made entirely of wood. Each room has electricity, air conditioning, a safety deposit box, a canopy bed and a private bathroom with hot shower. After showering, we headed back to the klotok to enjoy dinner on the top deck to the sight of many fireflies all around. We enjoyed our dinner with the only light coming from candles, stars and fireflies! The moon was not visible, so the stars were very bright and the Milky Way was easy to see stretching across the sky. When planning a trip to Tanjung Puting, you should take into account the phases of the moon as nights without a moon in the sky are more beautiful to behold with the myriads of fireflies and brilliant stars being so much more visible. After dinner, we returned to the Rimba Ecolodge to sleep. I decided to wake up very early the following morning to observe the proboscis monkeys and the amazing birds around the docks. Tanjung Putting alone is home to about 230 species of birds, and about 20 are endemic to this region. Three monkeys visible in the dock area made me worry about all the stuff that I brought! We continued travel upstream to Pondok Tanggui to witness another feeding orangutan attraction on the 2nd day. Orangutan feeding started at 9am at this site,so that we should left early morning after had an enjoyable breakfast at the hotel. It’s distance about 12 km from the hotel and need about 1 hour 45 minutes to get there. We did trek into the jungle under canopy for about 1 km to feeding point. The king of the local orangutans, Doyok, did not come to the station so we didn’t see him. Sometimes several days will pass without a visit, but at other times he comes each day. We continued our journey from the Pondok Tanggui to Camp Leakey, the place where orangutan research began. Camp Leakey is located on the Right Sekonyer River, a tributary of the Sekonyer itself. Unlike the main river which is brown from the mining and plantation activities upstream, this small tributary is black. According to our guides, this is because the river bottom is black but the water itself is actually clear. The river branch is located about 7 km upstream from Pondok Tanggui and the trip there takes about 45 minutes. The klotok still must travel an additional 8 km up the Right Sekonyer to reach Camp Leakey, a cruise taking about 50 minutes. Here the river is so narrow that only a single klotok may pass in places, and any others need to wait their turn before clearing the narrows. Camp Leakey was founded in 1971 by Dr. Birute Mary Galdikas and her ex-husband Rod Brindamour. The Leakey name comes from Louis Leakey, Dr. Galdikas’s teacher and mentor. The world is blessed to have three “Leakey’s Angels” – protégées who have become pioneers in the study of their selected primates. There is Dr. Galdikas with orangutans, Dian Fossey with mountain gorillas and Jane Goodall with chimpanzees. The locals call Dr. Galdikas “Mrs. Professor”. We had to walk 400 meters on wooden planks from the dock to reach the center of the Camp. Here we met some orangutans as most of the ones nearby prefer to spend their time at Camp Leakey instead of out in the wild. Other primates found in the area of the camp are monkeys and gibbons (uwa-uwa in the local language). Camp Leakey has a study center filled with information about the orangutan’s life, food and habits. Displayed here are the photos of Dr. Galdikas on the cover of National Geographic in 1975, and that of her son Binti in the shower with an orangutan on the cover of a 1980 issue. On the wall is a display depicting the genealogy of the area orangutans. 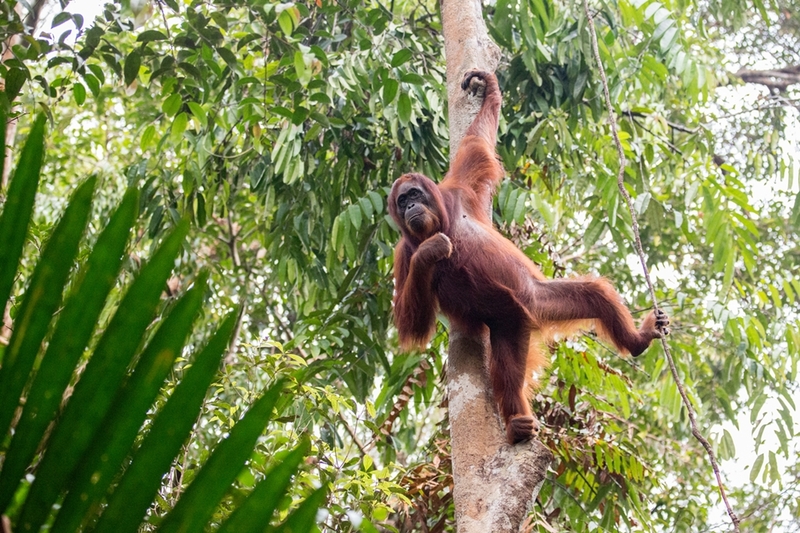 One orangutan who prefers to spend her time at Camp Leakey is Siswi. She was featured in the movie Born to be Wild 3D and was dubbed the ‘front’ because she is usually one of the first orangutans encountered by tourists when they arrive at Camp Leakey. In the film she is seen eating instant noodles from Dr. Galdikas’s plate. Like humans, orangutans have unique personalities and they treat each other according to their different natures. Once Siswi was a favorite of Kusasi, the king orangutan, to the extent that she was dubbed the “queen orangutan”. She then got sick and after recovering she lost her appeal as Kusasi never again paid attention to her. When Kusasi was replaced by Tom as alpha male, Siswi tried to gain Tom’s affection by parading around in front of him. Tom was annoyed enough by her antics that one day he just threw her out of the group. She was clearly sad and aloof for a few days. If she’d had a Facebook account, her relationship status would have been “it’s complicated”! The guides love to talk story about these orangutans with zest and zeal – like an informercial host on television. The core story was like gossip amongst men – love and power. Some documentaries are like “Orangutainment” – for example The Orangutan King from BBC Natural World, or PBS Nature’s From Orphan to King. We walked 1.2 km from the information center to reach Camp Leakey’s feeding station. Here, at 2pm, food is offered. We walked with some students to the feeding where a tense situation had occurred. Tom, the local king, tried to approach the feeding platform from behind us so we parted to make room for his 140 kg frame. Once he passed us by, he got mad and threw a log with one hand. Only after the guides calmed him down did he move to the feeding platform to eat. We climbed aboard the klotok and headed to Pondok Ambung to shower. This dock is still in the area of the Sekonyr River where the water is clear. Our klotok pumped water into the shower in the bathroom – and it turned out that this water was fresh and crystal clear. Pondok Ambung is a tropical forest research station. We continued on to Pesalat pier for the night, a 19 km cruise taking about 2 hours and 45 minutes. In the morning, we headed for the forest rehabilitation site with a walk of about 1.2 km. This area was once a farm that used the burning technique to rotate crops. Although it is surrounded by dense forest, the woods are full of reeds making it difficult to grow things here. The remains of the forest can be seen here including a burnt out ironwood tree some 20 meters tall and hollow inside. This tree is inhabited by woodpeckers who were hard at work making noise. Here there is also an information center and souvenir shop. We planted about 20 tress of various types, with each tree inscribed with the name of the person who planted it. From Pesalat, we took the klotok to Tanjung Keluang Nature Park. This place is located in Kubu Bay, on the shores of the Java Sea, far beyond the area of Tanjung Putting National Park. This trip was 35 km and took us 2.5 hours. Tanjung Keluang consists of 2,000 hectares at the southern end of West Kotawaringin regency, and it is designated as a natural park. We berthed on a long, thin peninsula only about 50-100 meters wide. Pine trees have been planted here replacing the original forest which was destroyed by fire. Coastal erosion is a real problem in this area. There is a hawksbill turtle breeding center in Tanjung Keluang. The park officers look for sea turtles nesting on the beach every night. The spawning turtles are helped and protected from predators. The eggs are taken to a breeding center and hatched, safe from the threat on the beach. The tiny turtles are then released into the ocean. Hopefully, once they mature, they will return again to this beach to lay their eggs. Late in the afternoon, we released some of these tiny turtles into the sea. Tanjung Keluang beach is a thin peninsula stretching from north to south, so tourists can enjoy sunrise and sunset without having to walk very far. On the west side, one looks out over Kubu Beach and on the east side the National Park itself, so the sightlines are not perfect, but rewarding nonetheless. At night, we walked along the eastern side under a pine canopy with park rangers looking for nesting turtles. Unfortunately, we did not spot any during the entire three kilometer walk. We returned to the dock and bought shrimp from a local fisherman’s shack feasting on them while enjoying the amazing views of the sky. We then returned to spend the night in klotok, moored to a jetty beach of Tanjung Keluang. The next day was time to return to civilization! We cruised in the klotok back to the beach in Kubu village, then we drove in our car all the way back to Pangkalan Bun – a 28 km journey taking about an hour. Both sides of the road were dominated by huge palm oil plantations. Upon arrival in Pangkalan Bun, we were taken to Yayasan Orangutan Indonesia (Yayorin), an organization trying to save wildlife by conservation of the rain forest habitat. Yayorin’s offices were lush with trees and very impressive. They have a spacious library where films can be shown, as well as a pavilion and a gift shop. Outside is a garden with plants and fish ponds. We were told that the local community enjoys the facilities of this office at no charge. From here, we headed to the Swiss-Bell Inn Hotel for the night. This hotel had just recently opened when I wrote this article and it is the only three-star hotel in Pangkalan Bun. The neat and comfortable room was certainly a pleasure, but it could not duplicate the sensation of sleeping in the wild that we felt only two days before. The last day in Kalimantan began with a visit to the Istana Kuning (yellow palace) royal palace. This is the center of Kota Waringin, an Islamic kingdom located in the south of the island of Borneo. This empire encompassed what is now West Kotawaringin, Lamandau District, Sukamara, Seruyan and East Kutawaringin. The current palace was renovated after a fire in 1986. Pangkalan Bun became the capital city of the regency in 1814 replacing the old capital of Old Kotawaringin. When the capital was transferred, a flag pole still in use was unveiled across from the Yellow Palace. We were scheduled to fly directly to Jakarta in the late afternoon, but due to a mechanical problem, we flew to Pontianak instead and stayed there overnight before continuing on to Jakarta in the morning. Events like this are quite common and visitors should be prepared for them.